There are pros and cons to living in close proximity to your neighbors. On the one hand, you can enjoy a strong sense of community that might not be found in an area that’s more spread out. But on the other hand, sometimes you just want a little privacy! Especially now that the weather is nice and people are spending more time outside, any lack of privacy will begin to make itself apparent. So what’s the solution? A privacy fence in Richmond! A privacy fence is a great way to create your own little space in your backyard that you can have all to yourself. In this week’s blog, we’re going to talk about design tips for a privacy fence in Richmond, so you can get a few ideas for your new fence! 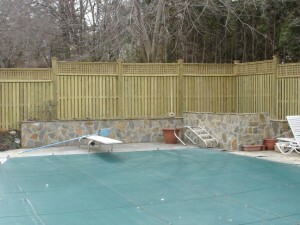 Create your own space with a privacy fence in Richmond! Light-colored fence materials are best for a privacy fence in Richmond. This is because light colors make a space feel bigger, while darker colors make a space feel smaller. In addition, light colors better reflect sunlight, which will help to keep the space brighter. With a privacy fence in Richmond, it’s best to stick to one color scheme. If you try to do to much with the fence’s colors, it will make the space feel smaller. A good idea for color is to match the color of the fence to whatever color is most common in your garden, if you have one. In the case of privacy fences, the fence isn’t going to fade into the background. So because the fence is going to play a major role in the look of your backyard, it’s a good idea to go all out. Decorate the fence with things like planters to add functional garden space above the ground! Or, choose cool visual objects like watering cans and other gardening tools. Not only will these look cool, but you’ll have easy access to them whenever you need them. For the evening time, lighting is a great way to accentuate the interior of the space created by your privacy fence. Choose energy-efficient outdoor lighting that will save you money on energy in the long run. This entry was posted on Thursday, May 14th, 2015 at 8:51 pm. Both comments and pings are currently closed.